Following the events in AirStrike 2, the N.I.T.O. terrorists are at it again and have set up a brand new base of operations and developed a new kind of explosives. They can not be allowed to have the advantage and so they will be invaded. The attack to destroy their facilities will come from a heavy battle helicopter and it's pilot, who will enter the enemy territory and destroy their equipment. This follows the same standard gameplay as previous games: It is a vertical shooter that can be changed between an angled 3-D mode and a top-down 2-D mode. 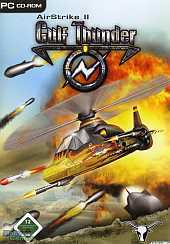 The player chooses from among 3 different helicopters, rated on Speed and Armor. Then it's flying into battle where the helicopter can move along the bottom half of the playing area and fire directly in front of it with the primary weapon, or fire missiles. Power-ups take the shape of 10 different primary weapon types, 5 missile types and 15 other bonuses. The player can destroy squadrons of enemy air vessels as well as ground-based facilities. There are 24 levels total and over 100 different types of enemy units, which include 2 bosses. The levels will feature 5 different types of terrain at different types of day and weather.